Most of our "microwave generation" children do not know where their food really comes from and they have little opportunity to experience farmlife. Now you can help change that! Your help is needed to provide children with the opportunity to have a Fun On The Farm! Hands-On Activity Farm Tour. Tours last from two to three hours. Volunteers are needed to help as Tour Assistants and Tour Leaders. No experience is necessary; we will train you. Come and have fun on the farm as you help give the children a most memorable and wholesome learning experience of life on a small family farm. 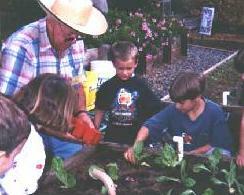 Call us now to volunteer your time on the farm with the children. Thank you for considering serving today's youth and sustainable agriculture in this way. The care and feeding of goats, sheep and chickens. Graphic design, illustration and sign making. The keeping of systematic records of money transactions. The construction and repair of needed projects in rough and/or finished carpentry. Interior cleaning on a regular or project basis. Varied office duties such as filing, word processing, cataloging, record keeping, or misc. secretarial. The food prep for special events and/or specialty cooking classes. To perform for special events and for our Senior's Tours. The tending to equipment upkeep such as the tractor, mower, pumps, etc. Assist in finding new resources to fund the project. Helping with any of the many phases of raised-bed vegetable growing. To search out and help secure grant funding. Landscape upkeep including mowing, trimming and sweeping. The picking and sorting of fruit, vegetables and nuts. The monitoring and repair of irrigation lines. The availability for consultation on civil and/or nonprofit legal matters. The availability for consultation and/or document generation and back-up for nonprofit accounting practices. Tree maintenance such as watering, pruning, fruit thinning, mowing weeds, and raking. The washing, packing and displaying of produce and other farm stand related activities such as cleaning, supply inventory, stocking and order filling. The washing, cutting and loading of fruit and veggies into the solar dehydrator and packing them when dried. Maintainance and repair of solar equipment. The historical documentation of projects, events and construction. Also educational video film-making.